Diana’s silk satin gown is beautiful. Strapless, with a fitted bodice, the wedding dress is embroidered with crystals and seed-beads. The embroidery covers the skirt and the train area. The wedding dress is topped off with a cute bow on the back. When we received the gown, it was very dirty and the train was stained with grease, dirt, and a yellow spill. There were also make-up and perspiration on both underarms and inside the bodice. Pinkish stains dotted the front, in the middle of the embroidery. The crystals had also started to transfer blue dye onto the front of the dress and on the train. Diana only wanted a wedding dress cleaning. 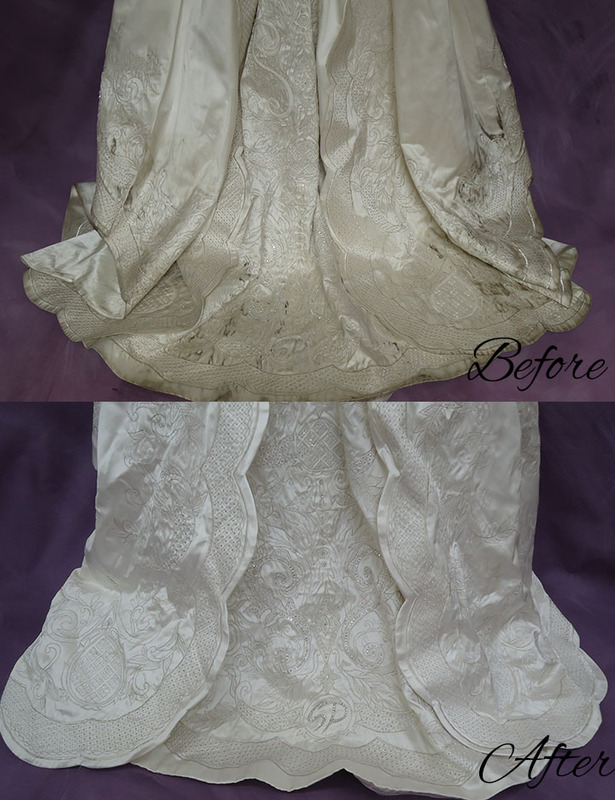 We were able to clean the gown using a virgin solvent. The yellow and pink stains were saved through a virgin solvent. The gown is now looking clean and beautiful!